In a major relief to the senior citizens, old age people, the State Cabinet headed by Chief Minister Pema Khandu in its meeting today, fulfilled the State Government’s commitment of enhancing old age pension and disability pension made during the budget speech of 2017-18. The state cabinet made substantial enhancement to the monthly pension of Old Age Pension Scheme, National Widow Pension Scheme and National Disability Pension Scheme on the state share component. As per the approved proposal, Old Age Pension Scheme for (60 to 79 years) which was earlier at Rs. 200 has now been enhanced to Rs.1500 with the state share of Rs. 1300 thereby recording an increase of 86% in the grants. On the similar lines, Old Age Pension Scheme for (80 years and above) which was earlier at Rs. 500 has now been enhanced to Rs.2000 with the state share of Rs. 1500 recording an increase of 75%. The National Widow Pension Scheme for both below 80 years and above 80 years have been now enhanced to 2000 from the earlier 300 and 500 respectively with the state share of 1700 and 1500. Similarly, National Disability Pension Scheme saw a leap of 85% in its grants with the new enhanced amount pegged at Rs. 2000 against the previous grant amount of Rs. 500/300. It is worth mentioning that all these social security schemes were hundred percent centrally sponsored programmes. 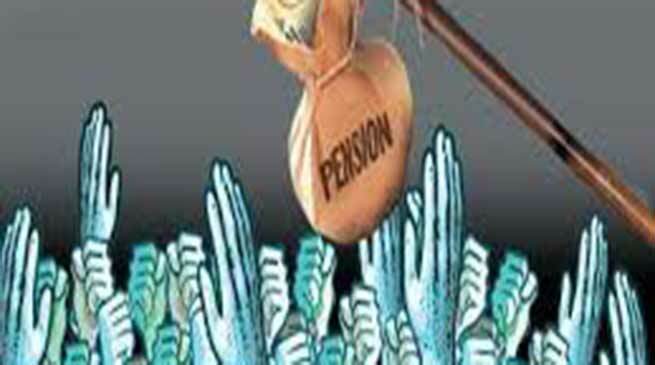 My mother is above 80yrs but still she didnot get pension what to do. Plz help.